Like the good people of Arizona, I despise speed cameras. But not because I want reckless driving. Instead, my disdain is based on the fact that governments set up cameras where speed limits are preposterously low in order to generate revenue. And I speak from personal experience. Like the good people of Houston, I also despise red-light cameras. But once again, this isn’t because I want jerks racing through red lights and endangering innocent people. Instead, my opposition is based on the fact that greedy governments – operating recklessly – use such cameras as tools to fleece drivers. Holman Jenkins has a column in today’s Wall Street Journal, explaining how the industry was supposed to operate. A promising industry betrayed by the behavior of its customers—that’s the story of the red-light camera business. …Redflex Traffic Systems, leading practitioner of the once-sparkling business of setting up automatic traffic-enforcement systems for municipalities. The company and its industry were set to grow. The product improved traffic safety, freed up officers for more important work, and paid for itself. Towns and cities didn’t even have to budget a dime upfront because Redflex assumed the costs and risks of setting up cameras at designated intersections. But in the real world, that’s not what happened. Politicians all over the nation used cameras as revenue-generating devices. …serial revelations by the Chicago Tribune about the city’s buccaneering ways—running its camera system for profits rather than safety. …New York state conspicuously authorized cameras at various upstate locations in 2010 to close a budget gap. When New Jersey last week let a five-year experiment lapse amid a voter backlash, Moody’s called the decision a “credit negative” for local treasuries. In California, public acceptance steadily eroded as politicians kept piling on “surcharges” that turn a hundred-dollar traffic offense into a $500 fine in the mail. …the Trib cited the city’s “long-standing reliance on using the lowest possible yellow light time” to maximize revenues even at the cost of encouraging more accidents. …a universal peeve of motorists, being fined for a harmless rolling right on red. At this point, some people may be thinking that this is no big deal. After all, they might argue, at least the cameras make the roads safer. But according to research commissioned by the Chicago Tribune, the cameras simply replace one type of accident with another, at least in part because the city government rigged the system to maximize revenue rather than safety. Here are some excerpts from a report published by Reason. Chicago’s red light camera program hasn’t made driving in the city any safer and has replaced one type of car crash for another. The cameras are there obviously to make money for the city, not for the benefit and safety of the residents. The Chicago Tribune commissioned a study to break down the city’s claims that cameras have reduced right-angle crashes at intersections by 47 percent and calls the number nonsense. They calculate that it actually dropped the rate of crashes that caused injuries by only 15 percent. That wouldn’t be such a terrible number if engineers hadn’t also calculated that their cameras didn’t also cause a 22 percent increase in rear-end collisions that caused injuries. …the Tribune story makes sure to point out how much revenue the city has gotten from the program—$500 million over 12 years. 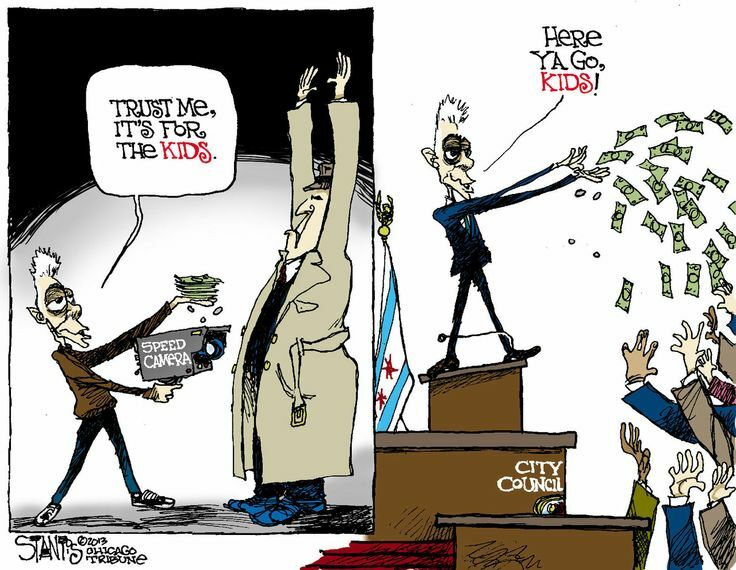 The Tribune also reminds readers of the many, many, many scandals and issues the program has faced, like tickets handed out for lights that had yellow signal times below the national standard, unexplained ticket surges, and outright bribes from a company operating the cameras to city officials. By the way, this data from Chicago isn’t an anomaly. Radley Balko has reported on similar accident-causing scams all over the nation. So now, perhaps, you’ll understand why I wrote more than three years ago that Jay Beeber is a hero. And why I expressed admiration for England’s NoToMob. But I confess I’m nonetheless conflicted about cameras. Simply stated, I don’t want morons driving 60 miles per hour on residential streets. And I don’t want narcissistic jerks zipping through intersections a couple of seconds after a light has turned red. Cameras, if properly operated, could discourage genuinely dangerous behavior. So here’s the libertarian quandary (actually it’s a quandary for everyone who wants a sensible society). How can you give government the power to enforce legitimate laws without simultaneously giving government the power to abuse people? 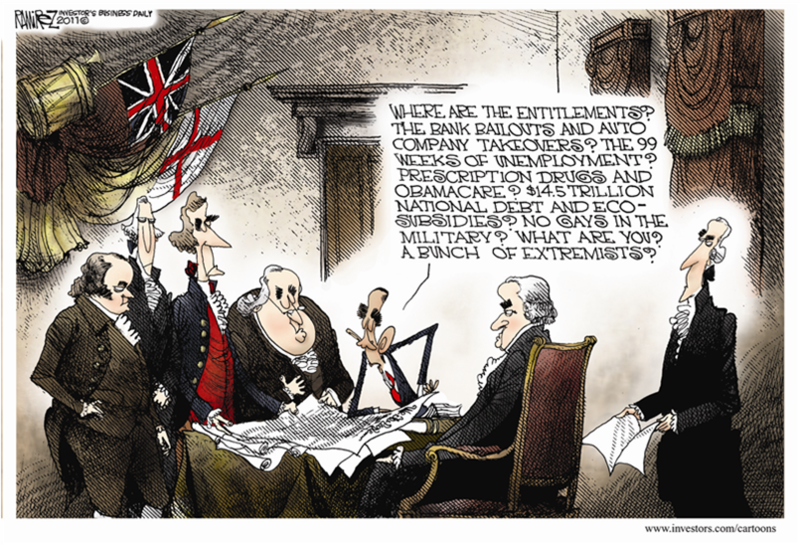 Unfortunately, courts haven’t done a good job in recent decades of constraining the federal government. And the only halfway decent constraint on state and local governments is jurisdictional competition, and that’s a necessary but far from sufficient condition for good policy. Returning to the narrow issue of cameras, part of the solution is to reduce government’s role in transportation. We already have lots of privately built and privately operated highways in America (and even in the United Kingdom). And private developers also build and operate some local roads. So why not let them set – and enforce – the traffic rules? Such a system wouldn’t be perfect, of course, but I’m guessing we would have better rules than the ones imposed by politicians. Or we can let politicians use new technologies to further monitor and control our lives (and empty our pockets). P.S. If some brave citizen got arrested for busting a bunch of revenue cameras and I somehow wound up on the jury that decided the case, you can probably guess what I would do. P.P.S. 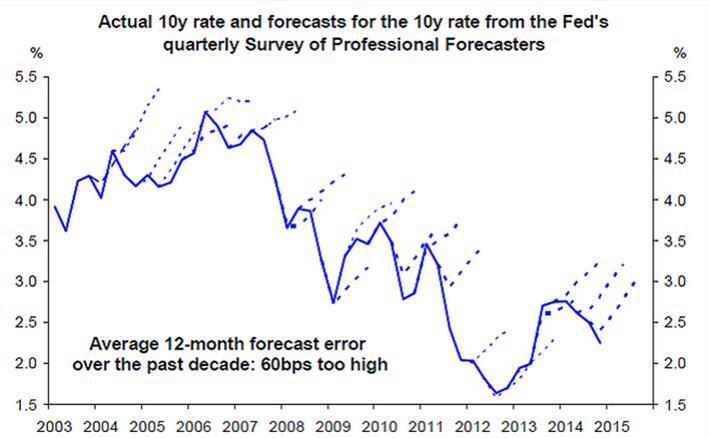 I shared a chart back in 2010 to show that economists are terrible forecasters. Now we have more evidence. But instead of looking at growth predictions versus reality, here’s what economists predicted about interest rates compared to what actually happened. This chart helps to show that economists shouldn’t try to make short-run predictions, which good economists already understand. Whereas the bad ones are easily confused with con artists. No wonder it’s so easy to make fun of us. I got out of a red light ticket by sending a letter produced by an attorney to the red light company that was operating outside of California. The letter explained how I want to abide by all local laws regarding the red light ticket, however, we questions the level of jurisdiction and constitutional authority but could they please confirm with me their legal standing in California (they were an Arizona company) to act for the local jurisdiction in submitting their requests regarding who was driving the car and their ability in collecting a find. After that letter I never heard a word from them and the ticket never was issued to me or filed against my car. Two weeks after this incident I read an article in the local newspaper that the local red light ticket machine generated $750,000 for the city for the previous year. I came to the conclusion that I did not receive a response to the ticket because the company (city) did not want some ticket conspiracy nut job to take to to court and get a ruling that might disrupt their cash cow for collecting tickets from people (SHEEPLE) that never question authority. That’s my story.